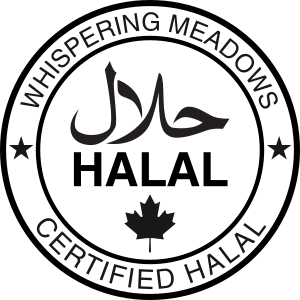 Whispering Meadows is pleased to offer halal-certified chicken and beef to our Muslim community in Southern Ontario. Our naturally-raised and organic meats are blessed by our Muslim halal certifiers, Ahmed Obdie and Ahmed Abraham. All of our beef options (except beef jerky), and our whole & pieced chickens, are available as halal meats. Our Halal Blessers have sworn a holy oath to perform their duties with honesty and integrity. They follow the zabiha process of slaughtering a halal animal under strict Islamic rules. A single, humane, quick cut is made through the oesophagus, veins and arteries of the animal’s neck, without cutting the spinal cord, after reciting Allah’s name and while continuously reciting the Tasmiah blessing. We are also careful to ensure that every aspect of our cleaning, sanitization, processing, and packaging materials meet the rules of halal and Islamic dietary requirements. Our animals are naturally raised on organically-grown grass and non-GMO grains. They are never fed any animal by-products, and are not grown with any antibiotics or synthetic growth hormones. Because we raise all of our animals with care and kindness, they live a stress-free life at the peak of health. Together with our supervised zabiha process, every part of the production and processing of our animals strictly conforms with the rules of halal. We also process and store our halal meats separately from all of our other products. To order your halal meats, just add as much beef and chicken as you want into your shopping cart. 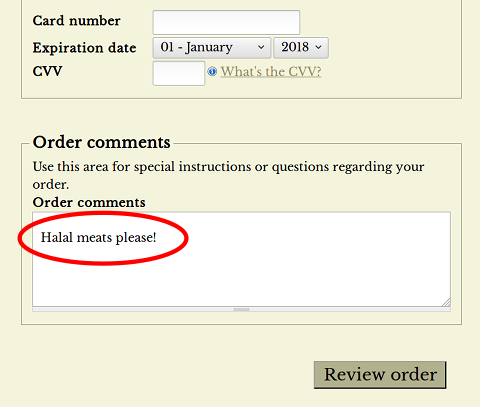 Then when you go to checkout, at the bottom of the checkout page, add a request for halal meats into the Order Comments. There is no extra charge for our certified halal products. We process and store our halal meats separately from all of our other products. All of our beef except beef jerky can be ordered as halal, and our whole or pieced chickens can also be ordered as halal. At this time our individual cuts of chicken (breasts, thighs, wings, etc) are not available as certified halal, so please only order whole or whole-pieced chicken. Each of our halal products comes with a halal certification sticker attached, guaranteeing that it has been raised and processed according to strict Halal Zabiha processes. and raised on GMO-free, organically grown grains & feed. You can order whole or pieced chickens with a $10 deposit per bird, with the final price based on their exact weight. The balance is due on pickup or delivery. Each chicken is around 4.2 to 4.8 pounds when packaged, and can be ordered whole or cut. Click here to order. 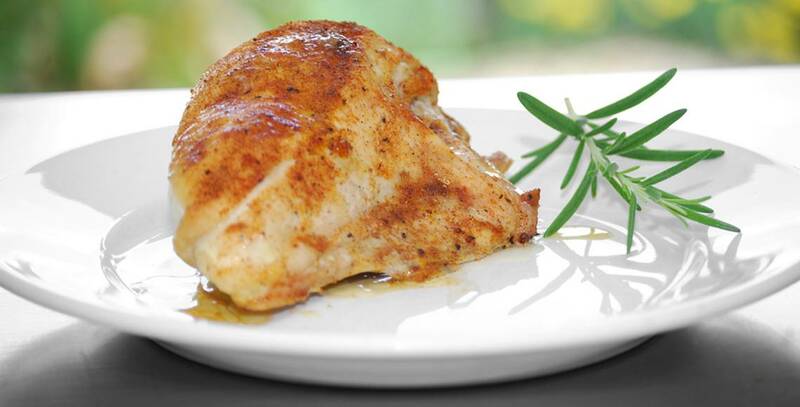 If you haven’t tried organic chicken before, you won’t believe the difference in flavour. Many professional chefs are now using organic ingredients exclusively, because of the fuller and richer flavour. Your recipes will get an instant boost in deliciousness just by switching to Whispering Meadows chicken. Click here to order organic halal chickens. Remember to mention in your Order Comments that you need your meats to be halal when you check out. Or call or email us to let us know. Whispering Meadows produces some of the best beef you can find anywhere, at any price. All of our beef cattle are raised on organically-grown pastures, thickly planted with a rich blend of natural grasses and alfalfa, and they are free to roam wherever they like. In wintertime, we feed them our own hay, harvested from these same pastures, so their meat is always nutrient-rich and delicious. Our grass fed beef is raised 100% on pasture grasses, and nothing else. Grass-fed beef is considered by many people to be the healthiest, most natural form of beef, with the most complex flavour profile and the richest nutritional value. 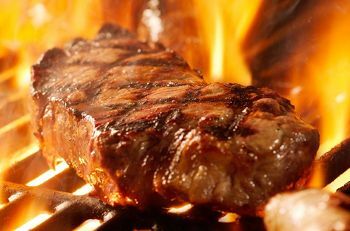 However it does need to be cooked carefully to make sure it stays tender — we always recommend the reverse sear method. The grain-finished beef is also grass-fed for its entire life, plus it’s supplemented with whole non-GMO grains, which give the meat maximum sweetness and tenderness. If you don’t know which to choose, this is the option that we recommend you start with. 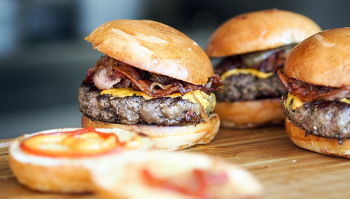 You can read more about choosing between grass-fed and grain-finished beef here. There are many options for you to order halal beef. The most flexible and economical, if you have the freezer space, is to order a side or a half-side of beef. This allows you to choose exactly how you’d like the beef to be cut — choose your steak thickness, decide how much you want in roasts and ground beef, and have each part of the animal cut the way you want it. If a side or half-side is too much beef, we also have some mixed boxes with a nice selection of cuts. Our BBQ Select Box is 30 pounds of beef and fills about 1/4 of a standard fridge freezer. And our Mini BBQ Box is 10 pounds of beef, intended for first-time buyers to try out our meat. Our only beef product that we can’t certify halal is our beef jerky, because it is made with naturally brewed soy sauce and red wine vinegar, which may have contained traces of alcohol before it is dehydrated. We want you to be absolutely sure that by ordering our natural & organic halal meats, you’re getting the very best tasting, most nutritious, and heathiest meats that you can find anywhere. 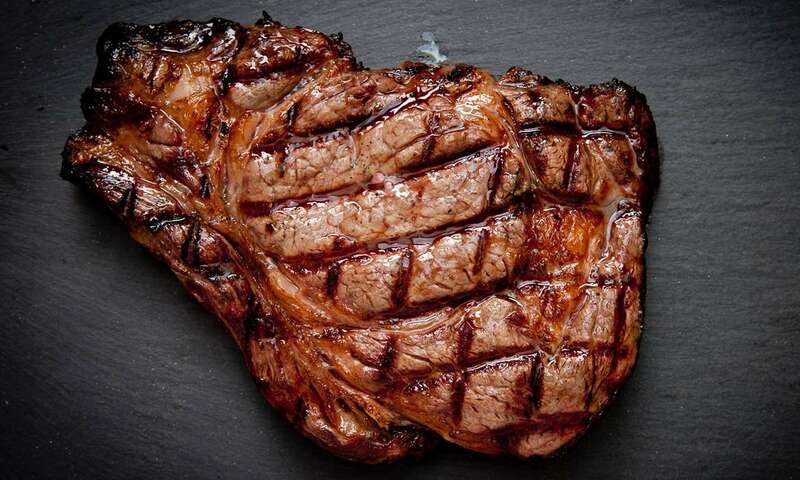 That’s how sure we are that you’ll love our meats. We’ll take all of the risk in asking you to try them — and we stand behind our guarantee. You have our word as family farmers. But don’t just take our word for it. Read some of the amazing feedback we’ve received from our customers! Order online: browse through this site – you can use the menus at the top of every page – to add the meats you want to your shopping cart. Our easy checkout process accepts Visa, Mastercard, PayPal, cheque or money order. Please note that if you are outside of Ontario, industry regulations do not permit us to ship uncooked meats to you. Randy & Ang: 1-800-439-3081 (toll free) — please call us any time if you have any questions! You can read more about our naturally-raised beef on our main beef page. And find out more about our organic chickens on our main chicken page. Feel free to browse through our products and add whichever ones you want to your shopping cart. Then remember to mention in your Order Comments that you need your meats to be halal when you check out — or call or email us to let us know.